Crest Cleaning Services provides the very best Seattle window cleaning service throughout the Puget Sound area. Regardless if the work involves a contractor, homeowner, or business we make sure that all of our customers are satisfied with our window cleaning and related services. We use a squeegee and a sheepskin mop to clean our customer’s windows by hand. We access problem areas safely. We use professional grade window cleaning tools such as fall protection, leg and bar levelers, and stabilizer bars on our extension ladders. 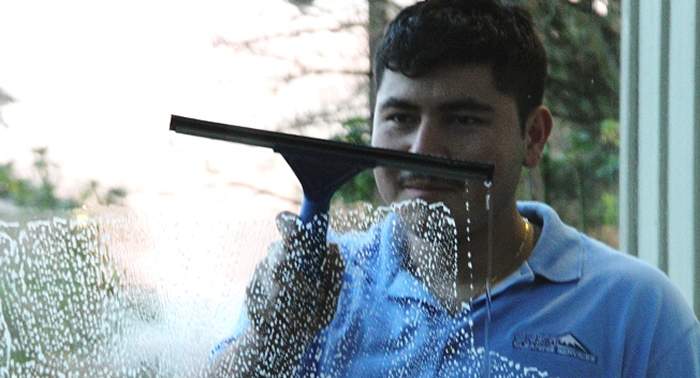 We clean both the outside and inside or both of our customer’s windows. Our customers can also elect to only have us clean their most prominent windows. That way they don’t have to pay for the cost of cleaning all of the windows in their home and still have consistently clean windows. Although it isn’t necessary to move window dressings or furniture we will ask our customers to move any breakable items away from their windows when we are preparing for an interior window cleaning. When necessary, we can move furniture but will work around most of the items in our customer’s home. Because safety is always our first concern and it can be very difficult to get close enough to the customer’s windows to clean them if there are any untrimmed trees and bushes close to the house, we might not be able to clean those windows. This is only true if those untrimmed trees and bushes make it unsafe to climb a ladder. However, we can usually find a way to clean any window, regardless of its location. Our customers should let us know if there are any special circumstances that we need to be made aware of prior to our cleaning their windows so that we can take the necessary steps to provide them with the best and most convenient service we can offer. We offer our window cleaning services to both commercial buildings, such as apartments, condominiums, and townhomes, as well as residential customers. We are available 24 hour a day seven days a week with a quick response time. We also provide an appointment reminder callback. Crest Cleaning Services provides Seattle window cleaning for storm windows, as well as exterior and interior windows and skylight window cleaning. We are an affordable, reliable, and professional window cleaning service. We have numerous years of experience in residential and commercial window cleaning and enjoy an outstanding reputation for integrity and quality in Seattle, WA and the surrounding area. There is no window cleaning job that is too big or too small. The commercial and residential market trusts our window service for their most difficult job. We can customize a window cleaning program to meet our customer’s individual budget and requirements regardless if our service is required weekly, monthly, semiannually or annually. We also provide quality, one time window cleaning at reasonable rates. We provide no obligation, free estimates. We have an immaculate reputation for cleaning commercial and residential windows in Seattle and the surrounding area. Our window crews will work diligently to make sure that all of our winding cleaning services are performed to the highest standards. We won’t be satisfied with the job until our customers are. Crest Cleaning Services’ Seattle window cleaning service will constantly monitor our work closely in order to guarantee the highest level of window cleaning services. We have property damage and liability insurance coverage and are bondable. The professional appearance of any residential home or commercial business can be enhanced with clean windows. We provide window cleaning services in the greater Seattle, WA area with commercial and residential window cleaning services. Windows that are cleaned regularly prevent etching and staining of the window glass from dirt. This can be prevented if the windows are professionally cleaned several times a year. The Seattle window cleaning that Crest Cleaning Services provides only uses the finest window cleaning products that are environmentally friendly. These products get windows squeaky clean by removing the grit and grime that builds up on both the outside and the inside of the window’s surfaces. Clean windows make any home more aesthetically pleasing to look at. Any homeowner who hires a professional window cleaner should ask what kind of window cleaning chemical is going to be used before they hire that professional. There are several window cleaning liquids that are usually available within the homeowners reach. These include lemon water, club soda, regular water, and vinegar. However, homeowners should know that cleaning their own windows can be a dangerous job, especially for second floor windows. Homeowners use windows to see the world outside. The residents or passersby will have an aesthetically pleasing view by keeping the windows clean because this helps the light to shine in. Crest Cleaning Services provides Seattle window cleaning to contractors, homeowners, and commercial businesses. We guarantee our window cleaning work.